The social media giant's market capitalization plummeted by $119 billion to $510 billion as its stock price plummeted by 19 percent. 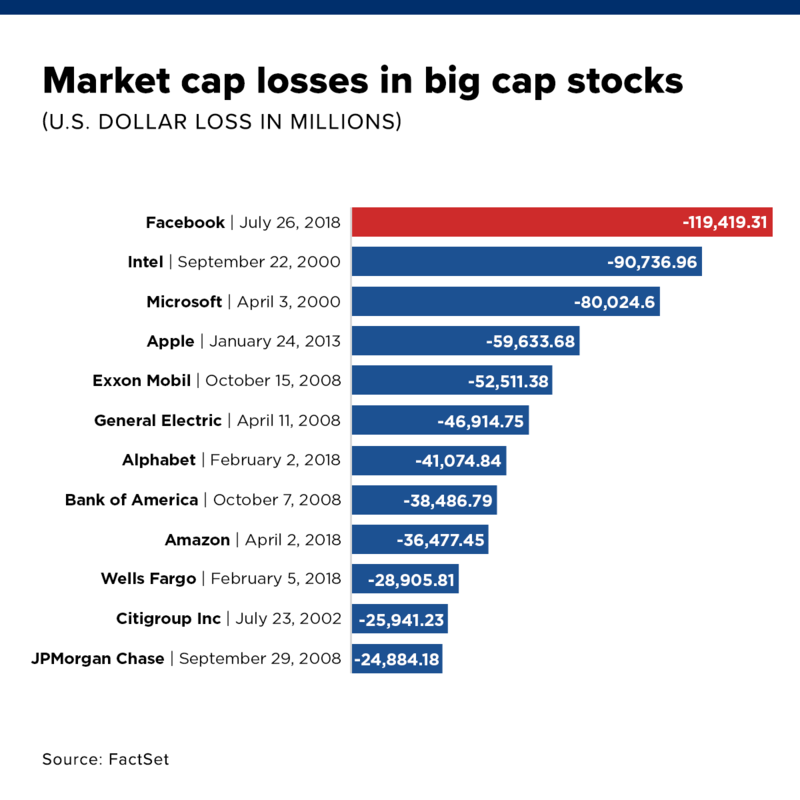 At Wednesday's close, Facebook's market cap had totaled nearly $630 billion, according to FactSet. Facebook's enormous loss in value came a day after the company reported weaker-than-expected revenue for the second quarter as well as disappointing global daily active users, a key metric for Facebook. The company also said it expects its revenue growth rate to slow in the second half of this year. Several analysts downgraded Facebook's stock, including Nomura Instinet's Mark Kelley. "With stagnating core user growth, we think there is too much near- to mid-term uncertainty to recommend shares at this point," Kelley, who downgraded the stock to neutral from buy, said in a note. The percentage decline was also the worst in Facebook's history. Facebook has seen a decline in monthly active users for the first time in its history. The decline was in Europe, which recently introduced a strict new GDPR privacy regulation. It shows that regulation is capable of curtailing Facebook's massive growth and capping its revenue. The worst is yet to come because the full impact of GDPR is yet to kick in. Facebook saw a decline in monthly active users for the first time in its history, the company reported Wednesday during its dramatic second-quarter earnings announcement. Any decline is significant and bad news for a company generally considered to be a rocket ship of growth. But what should cause some alarm is where the decline happened and its likelihood of getting worse. According to Facebook, European monthly active users dropped by 1 million between the first and second quarters, falling to 376 million from 377 million. It's the only region where Facebook saw declines, with the biggest region, Asia-Pacific, jumping to 894 million users from 873 million. The US stayed flat quarter-over-quarter at 241 million monthly active users. Facebook blamed the decline on "currency headwinds" and Europe's new privacy-focused regulation, known as GDPR. "GDPR was an important moment for our industry," CEO Mark Zuckerberg told analysts. "We did see a decline in monthly actives in Europe, down by about 1 million people as a result." GDPR was specifically designed to bring the big tech firms to heel, and it regulates how companies use people's data. Executives noticeably avoided talking about the ongoing impact of GDPR beyond the second quarter. "[We] don't have any update on trends," Facebook CFO David Wehner said in the company's earnings call. "We had indicated in the first quarter that we would expect to see a decline." He then specifically said Facebook wouldn't be providing guidance on monthly active users or daily active users in Europe on the call. There are multiple signs Europe won't recover. GDPR kicked in on May 25, two-thirds of the way through Facebook's second quarter. Facebook began showing its privacy notifications around May 24 to comply with the new rules. Facebook's thesis is that these notifications turned off its European users, who then spent less time on the platform and have perhaps become more privacy-conscious. Given that GDPR affected only part of Facebook's second quarter, there could be knock-on effects in the third quarter. The decline shows that Facebook, which seemed to be infallible, isn't invincible against regulation. And whether Facebook is even properly complying with GDPR is under some contention. At the moment, Facebook tells users who don't share certain types of data that they won't be able to use parts of its platform. That goes against the spirit of GDPR, which says companies can't penalize users for not sharing information. As the Pivotal analyst Brian Wieser put it: "Our view is that the company is far from 'out of the woods' as the bundling of consent for Facebook to use consumer data with access to the platform appears to be an aggressive interpretation of GDPR, and one that might be more subject to eventual regulatory action. "While those actions might take time to play out, it is still possible that threatened fines associated with GDPR to Facebook or other sellers of advertising could also have the effect of spooking advertisers into changing how they use data with media owners." In other words, a court could find that Facebook hasn't complied with GDPR, fine the company, and then force even stricter privacy measures that affect its European user base even more. Europe until now had been a stable market for Facebook. It's the second-biggest by active users, behind Asia-Pacific, and the second-biggest in how much money the company makes per user, behind the US. That's why Europe, despite being smaller than Asia-Pacific by user numbers, actually brought in more revenue. Europe made $3.3 billion in revenue, versus $2.3 billion from Asia. This is why any sign of decline in Europe is so drastic. While revenue and average revenue per user look intact for now, any sign of cratering engagement could scare advertisers away from Facebook's core platform. Facebook appears to know that, with its chief operating officer, Sheryl Sandberg, noting that advertisers were still adapting to the new rules. "GDPR has not had a revenue impact, but we also recognize it wasn't fully rolled out this quarter," she told analysts. "It was very encouraging for us to see that the vast majority of people affirmed that they want us to use information, including from the websites they visit, to make their ads more relevant. But, as we look further out, we recognize that there's still risk, and we're going to watch closely."